Referred to as, “cowboys”, in poker jargon, a pair of Kings is considered to be a top starting hand for any type of poker, with the ‘exception’ of 7 card stud hi-low. Because of the rank of the card being the second highest to the Ace, it is difficult for players to accept that folding a starting hand with a pair of kings is even be imaginable. However, after reading further about the odds and the strategy for stud hi-low, you will begin to understand that a pair of kings is one of the worst trap hands to fall victim to, if your pair of kings becomes Kings-up. Of course, depending on your position from the bring in, and the cards calling behind you, how many players are in the hand, and what other outs your combination has, it would be wise to start the practice of folding pairs of Kings in stud hi-low. Burn it into your mind: Fold Kings in stud hi-low. 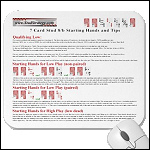 The main reason that this pair is a trap hand is because, as a general rule of playing hi-low, the best starting hands are combinations containing Aces to either scoop the pot or win the high end of the hand. Pocket Aces may be hidden under a door card of 8, door card aces may already be paired, or someone with a low has an ace in their pocket with a hand such as A35. Someone playing a high combination may have AKQ. (In this case your odds to catching 3 of a kind is considered dead. If you see another door card king also consider your hand dead.) In stud hi-low do not ever consider aces dead unless you see all 4 of them at the table. 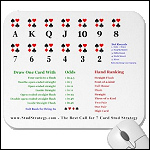 Therefore, assume that anyone calling may have an ace in their hand already, and any ace that turns up on the board on later streets has either tripped the aces in the hand, or has just boosted the hand to aces up. This may not be the case if someone is obviously playing the low, however, you will never know until the showdown at the river, and it can be a costly loss. The object of the game in stud hi-low is to sweep the pot, not necessarily to chop with another player as the time spent making money could be more productive playing stud hi. You want to sweep, so you want a combination that has competitive odds for sweeping. A pair of Kings offers very little more than to make two pair. Flush odds are low, three of a kind is a stretch, and odds to a high straight don’t usually offer much of the pot except to split, however, anything is possible in poker. A pair of Kings is especially dangerous to call with when a full table is dealt cards and there are no door card Aces showing. This makes it more tempting to be sucked into the hand and all the while you are likely to be betting into a pair of slow played hidden Aces or end up getting rivered with Aces-up. Any pairs are always competing with flush and straight draws and yet, because of the importance placed on Kings, the hand just seems more difficult for players to fold. So why would a pair of 9s be a better pair to start with? They are the red-headed step-child of the hi-low game. They do not qualify the low, and aren’t exactly considered a particularly favorable hand to start with when competing against higher pairs. However, because 9’s are often neglected, they are probably one of the most live cards in the deck if none are showing as door cards. With 9’s you will very often have odds to three of a kind and a bettering full house, and medium straights. If you have a decently high live kicker to back you, it is probably worth one or two calls if no threatening hands such as flushes and straights begin to appear. The 9 may also be the saving grace to close out the player who may be in a hand of 45678 and a player competing for the low has A2357. The 45678 hand has both a high and a low, however the low is not low enough to win, and is neither the best high hand vs. the 9. With this type of straight on the board the betting will most likely be raised to the cap for the rest of the betting rounds. 45678 is not an unusual catch at a high-low table. Back to the Cowboys, as my final notes, being in good practice with folding Kings at high-low will also probably save money and frustration when using this strategy at stud high as well. The hand has too few outs, is often trapped into calling after making a second pair, and becomes difficult to fold after the second pair is made. Once you are able to fold down pocket Kings and be relieved that you did after you watch the board and experience the tension you would have gone through calling against the aces, flushes, and straights showing, you will be more comfortable with being able to lay down other big hands in the future such as Aces-Up and other high pairs against flushes and straights on later streets, and not feel badly beaten over it enough to get tilted. Although there is always the probability that you would have actually ended up with the best hand, it is not worth the loss it often causes monetarily against Aces, and the frustration of being beaten or having to call against flushes and straights.